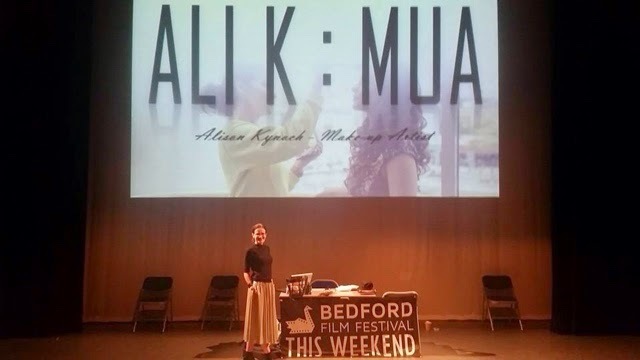 Last Friday was the start of Bedfords Film Festivals second year. It was running throughout the weekend. I was a tad nervous if I'm honest as I've not done a great deal of public speaking,never mind having to talk for a Whole Big Whopping hour. However I was lucky to have my friend Eddie who coached me and gave me tips on how to structure my talk. 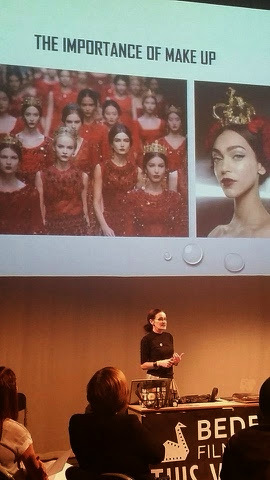 Once I got my introduction out of the way I relaxed and enjoyed talking to the lovely bunch of students about my experiences which I hope I gave them a valuable insite to what life is like as a freelance Mua. I would certainly give it another go as I actually ended running over my time! There were some amazing workshops on giving students a real feel into the work that takes place in the production of a film. Here is a pic of me just before I started my presentation. Referencing Dolce and Gabanna's S/S15 Collection.